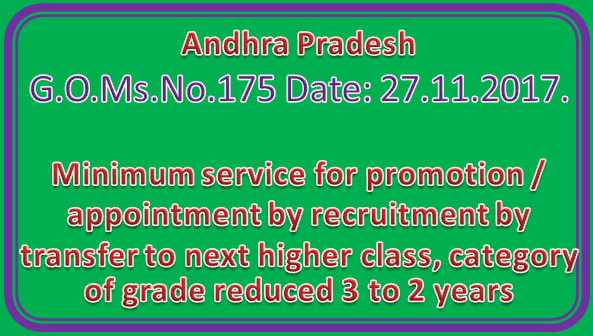 Public Services –State and Subordinate Services –Prescription of minimum service for promotion / appointment by recruitment by transfer to next higher class, category of grade - Ad-hoc Rule reissued. According to the policy enunciated in the G.O. 1s t read above, in certain special /adhoc rules relating to various State and Subordinate Services, a provision was made to the effect that the minimum period of service was reduced from ‘five years to ‘three years’ and since the above adhoc rule position created certain confusion, and to keep the matter beyond doubt without giving scope for any other interpretation, in the G.O.2nd read above, an ad-hoc rule was issued that minimum period of service wherever prescribed in the said rules for a member of a service from the lower category, class or grade, to the next higher category, class or grade, whether such appointment is made either by promotion in the regular line or by recruitment by transfer from any other service, that period shall be three years in the category, class or grade from which such promotion or transfer is made. 2. Government with a view to avoid administrative difficulties and in the interest of administration it is decided to issue an ad-hoc rule reducing the minimum required service from 3 years to 2 years. All the Departments who are following the Ad-hoc rules framed in G.O.Ms.No.230 G.A. (Ser.A) Department, dated:31.05.2014, shall issue separate rules prescribing minimum service in the feeder cadre / category as 2 years. Click Here to Get G.O.Ms.No.175 Date: 27.11.2017.